Hello, I am an American from New Jersey and I care about diners. The True American Diner is a casual sit-down restaurant that serves breakfast, lunch, and dinner — all three meals — all day, often for all twenty-four hours of it. Time has no meaning in the presence of eggs, steak and hash browns. Portions are large but not obscene; sides are available with nearly everything. The food is sturdy and simple, a few strong flavors and techniques. Nothing in a True American Diner couldn’t be made by a moderately skilled cook in their own kitchen: corned beef hash, club sandwiches, and a variety of scrambles. Menus are oversized and presented as a single, huge laminated page with unavailable items taped over, or in a leather-bound binder. Everything in the “diet” section of the menu contains cottage cheese or is steamed. There are daily specials, and they come with soup or salad. Chicken Parmesan and mozzarella sticks must be available. Ketchup is served in bottles, not packets. The coffee is available and drunk at every meal; cups may even be set out on the table before patrons arrive. Refills are free and assumed to be always wanted, unless you indicate you want no more by turning the coffee cup over. Dessert is pie, and if displayed in a glass case at the end of the counter, it must rotate. We did not free ourselves from England’s cruel yoke to have static pie. True American Diners run small, with a capacity that tops out at around sixty-five people plus counter space; thirties-style railcar diners rarely seat more than twenty people, but have long counters running the length of the restaurant. They are single rooms, with no areas for anything but food service. There is also no outdoor seating in a True American Diner. Where are you, a bistro in France, about to order a country pate’ avec moules frites? But not all diners are exactly alike. There are vintage sleek bullet diners, modern silver-and-neon highway beacons, converted farmhouses, dusty desert truck stops, low-slung ranch-styles attached to motels, and mansard roof shoeboxes full of fake grapevines that resemble suburbian banks. Somewhere, there is neon. 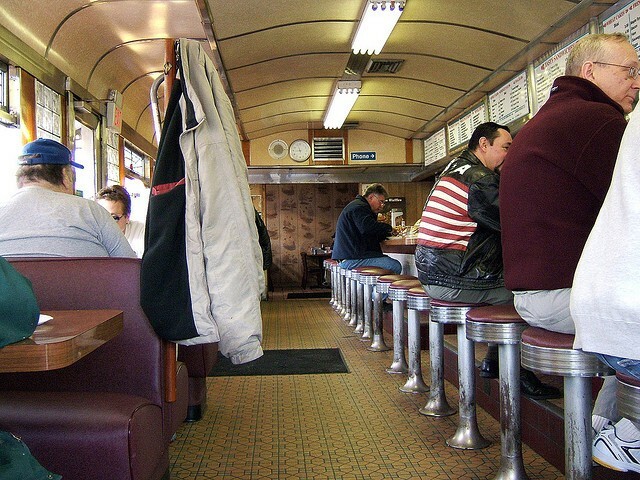 There are always leather or leather-ish clad booths in a True American Diner; without them, it’s just a breakfast joint. In the east, True American Diners are located either in the downtown area or just off a major road leading into it. In the west, diners are more likely on highways in between towns, merging with that other American institution, the truck stop. If a town has more than one, there will be unresolvable argument over which is “the good one.” People are very loyal toward “their” diner because a True American Diner will be family-run or at least locally operated. The ideal True American Diner owners are Greek, or at least willing to pretend. True American Diners exist in a bubble of no-nonsense egalitarianism; they exist outside socioeconomic distinctions, because there is something for everyone. There are always at least two retired people at the counter; they will never speak to each other or anyone else. Someone is on the run from the law; someone is the law. There are always at least two teenagers in a True American Diner and they are simultaneously talking about nothing and having The Most Important Conversation Of Their Lives. You wouldn’t go there for a special occasion, but you can always go there after one: proms, weddings, or funerals. Without diners, where would outlaws stop to discuss bank robberies over coffee? Where would strippers go when they get off work? Where would covert agents talk about business with waffles or lovers arrange clandestine meetings? Without diners, are you even sure you’re in America? John Leavitt is an American from New Jersey who cares about diners.